If you’ve read the news and seen the posts on Facebook, then you’re probably wondering what all the hub-bub is about Microsoft dumping Internet Explorer. Fear not! They won’t just hand over the reigns to Chrome or Firefox as the #1 most widely used web browser. So, is Internet Explorer Dead? Not quite. Then what is all the fuss about? With the news that the Microsoft team is working on their newest operating system, tentatively titled Windows 10, they have made reference to abandoning IE. As happy as that made many die-hard Mac fans, the news is somewhat misleading. In Microsoft’s case, they won’t be abandoning the browser itself, just the name. Currently, IE browsers are responsible for a whopping 56.64% of all website traffic. For Microsoft to stop making a program that has that much market share would be foolish. A simple rebranding and a redesign, hopefully from the ground up is what needs to happen. 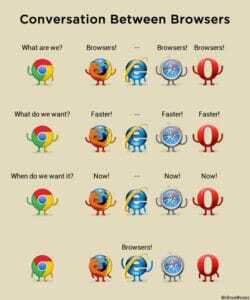 Over the years, Internet Explorer has gotten a bad rap due to poor security standards, slow loading times, and clunky website rendering. Any website designer will shudder when you mention the disaster that was IE 6. We still, to this day, groan at having to troubleshoot the problems in one of the most widespread incarnations of the most popular website browsers. Thankfully, IE 6 now only commands a 1.31% market share. With Microsoft renaming their web browser comes (hopefully) a new era of the PC version of Safari. Yes, every Windows machine has IE on it, but that doesn’t stop you from downloading Chrome, Safari, Firefox or even Opera, for that matter. Let’s hope that this new era of the Microsoft browser won’t be a mistake. I for one kinda want to see what it does. After all, when Firefox came out, it was the neatest thing in the world, then Chrome came out and it superseded it. After all, from early reports, the working title is Project Spartan. That’s a bold name for any project. Surely, Microsoft knows that in order to keep that 56% market share they will have to make some big jumps in usability and give users something that they’ve never seen before. Otherwise it’ll be more of the same and could go the way of the Zune.